When it comes to medical cannabis, very few aspects of the plant are as misunderstood as cannabidiol or CBD. CBD is a non-toxic, non-psychoactive and non-addictive compound that is found in the cannabis plant, that has flourished even in the unregulated market, due to its undeniable therapeutic properties. Nonetheless, it has suffered much from the stigma normally attached to other cannabinoids such as THC. Since CBD is not regulated, opportunistic scammers have peddled a lot of disinformation that has almost set CBD as the modern day equivalent of snake oil. Therefore, it is understandable why many people learning about CBD for the first time may be hesitant. One of our highest priorities here at Green Flower Botanicals is to curate and maintain our database of ongoing and available medical research on the effects of cannabidiol (CBD) on various conditions. We believe that the only way to remove the stigma associated with CBD is by providing clear and accurate information with regards to what scientists have found out through various studies. By spreading accurate information, we demystify any deceptions and ensure that those who may wish to benefit from CBD’s medicinal qualities do not miss out merely due to disinformation. Below, is a list of the research associated with CBD as a potential treatment for various medical conditions. 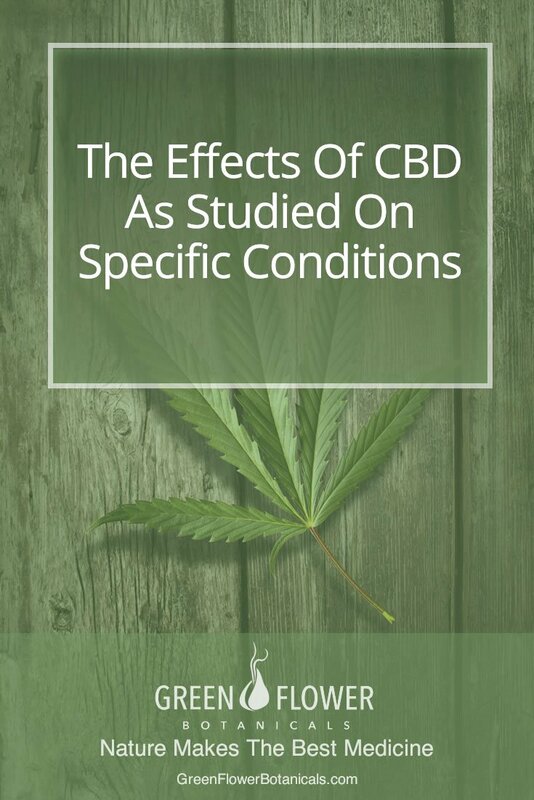 To get acquainted with the research on CBD and specific medical conditions, click on the corresponding link to find a list of all the relevant studies and abstracts. We understand that some of these studies may be too technical for you to draw clear conclusions and understand their implications. That is why you will find a short, introductory summary of all the studies on each of these pages. CBD products are not approved by the FDA for the diagnosis, cure, mitigation, treatment, or prevention of any disease. We are restricted from making any claims about the efficacy of our specific CBD products to treat or cure any disease or medical conditions. You should always seek the advice of a physician before adding nutritional supplements to your diet.